This is a VITAL message for the world today! Please prayerfully read and study this page for yourself, as great deceptions are upon us. Have you ever thought about this verse above in Colossians, and considered it's significance? The reason I ask, is because the majority of professed Christians miss the great significance of it. Paul tells us to beware of the philosophy and tradition of men, because many a people have been led astray all throughout history by the 'traditions of men'. This is such a vital message for the time we live in and is very much connected to the final warnings to the world found in the three angels' message of Revelation 14. While the majority follows after the world, we need to beware! So let us first look at the meaning of the word 'complete'. To be complete means to have ALL the necessary parts. Paul confirms in 1 Corinthians 1:24 that 'Christ is the power of God and the wisdom of God.' So if God the Father has given His Son ALL THINGS, and as Colossians 2 above says that in Christ dwells ALL the fulness of the Godhead. Then doesn't that mean Christ has everything HIMSELF to give us, including teaching, instruction, victory over sin AND the Holy Spirit? 1 - Why do the majority of professed Christians look to their church denominations and leaders, or the pope or Mary for truth and salvation when we are complete IN CHRIST, and He has everything we need? 2 - Why do the majority look to "another third being" for the Holy Spirit, when we are complete in Christ and Christ himself has ALL THINGS we need? We will deal with both of these questions on this page and provide vital truth that every single person needs in this world today. This is so important friends. I cannot stress enough how important this truth is. Please heed this message. The Message for the World! One of the biggest issues with professed Christians today is that they give their allegiance to their churches and look to their churches for truth, rather than going straight to Christ. And this is why there is so much confusion, division and deception. And this is why the majority of professed Christians will be shut out of the kingdom, just like the foolish virgins. WHAT IS THE DIFFERENCE BETWEEN THE FOOLISH VIRGINS AND THE SAINTS? - What did the foolish virgins do? They relied upon others for the oil and not Christ. This is vital to understand. Have a real good think about this. The oil represents the Holy Spirit, and Jesus said that the Holy Spirit will 'teach us all things.' (John 14:26) But who did the foolish virgins rely upon? Christ? No! They relied upon OTHERS to teach them and to give them their oil. So the wise virgins basically say ... "you relied upon others (churches/preachers) for teaching and salvation, go back to them and see what you can get from them." And while the foolish virgins were busy following others and trying to gain salvation through the various churches and leaders, instead of looking to Christ, the door was shut and they were forever lost! The true saints of God, the ones who are admitted into the kingdom of God are those who are not 'defiled' by the various churches, as they look to Christ alone and 'follow Him wheresoever He goes.' They don't follow the churches, they follow their Redeemer! This is the message that the whole world needs friends, that we are complete in Christ. Do you know what this also means? It means that Catholics need not look to their church, or the pope, or Mary, as we are complete in Christ. All other professed Christians, WHATEVER denomination or church you belong to, do not need to look to your church and leaders for teaching and salvation, as we are complete in Christ. Through faith, we lack NOTHING with Christ in us. We do not need any other person or church denomination on this world for salvation, as God the Father has given all power to His Son. And we do not need to look to any man for teaching and understanding, as Christ has it all to give us HIMSELF. God did not give all power to any church denomination, man or woman. He gave it all to His only begotten Son Jesus Christ. 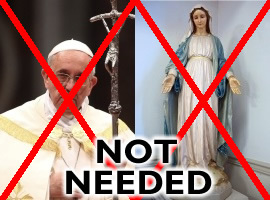 Therefore, if people continue to look to their churches and church leaders, and even dead people like Mary and the so called 'saints', they will NEVER be complete, but WILL be deceived. As we can only be complete in Christ alone. Oh friends! This is such a vital truth that everyone needs in these last days. There is so much deception all around us. Churches and religions are uniting in this ecumenical movement under Satan's banner for a false 'peace' (1 Thess.5:3). And our only safety is to drink of the water of life from Christ. No man or church can give you that water of life. It can only be sourced directly through the Son of God Himself. This is the message of the 'third angel' of Revelation 14. A warning not to be deceived by the 'beast power'. A warning not to put our trust in man and seek man's teaching, because man will deceive us. But rather to surrender entirely to Jesus Christ and trust in Him FULLY, and receive our teaching from Him alone. Why do you think Jesus said that no man should be called 'Rabbi', or teacher (Matthew 23:8)? Because as Jesus confirmed in that verse, HE is our only teacher and master. And Jesus knew that if we trusted in the teaching of man, then we would be deceived, as the thoughts of man are 'evil' (Jeremiah 17:9) and man is not capable of giving understanding the way the Lord can. It is a sad fact that the majority of professed Christians will never be complete and will never receive the Father's name (seal) in their foreheads, because they choose to follow their churches and their leaders instead of following Christ. They put their trust in man and will end up being deceived into receiving the mark of the beast. But as John confirmed above, it is only those who follow Christ wherever He goes who receive God the Father's seal. I would also like to say a word to my fellow Adventist brethren. You will not be saved by "staying with the SDA church". As being a member of the SDA church does no more for your salvation, than the pope can do for Catholics. And this is where many Seventh-day Adventists are completely deceived. They follow the words of their leaders more than the Word of God. When they want to find out a truth, they go to the popular preachers, instead of going to the Word (Christ) themselves. And many think that by simply being a member of this denomination, they will be safe, when the only safety we have is in the arms of Jesus Christ our Lord and Saviour. I am a (Historical) Seventh-day Adventist myself. But Jesus the Son of God is my Saviour, not the SDA church. Especially, when the current SDA denomination is in great apostasy. Through whom do we become 'partakers of the divine nature'? It is through Jesus Christ, the Son of God. And it is through Jesus that we can escape the lusts of the world and gain complete victory over all sin, as Jesus has everything we need for life and godliness. And that includes the Holy Spirit. You see, Jesus is the one who knows our every weakness. He is the one who knows what we need in this fallen human nature, because He took on our fallen nature (Hebrews 2:16-18, Romans 1:3, Romans 8:3) - and conquered! This is why God the Father has given everything to His Son, because it is only through Christ that we can be renewed and restored to God. Do you realize that we too can have the fulness of God in us? Paul confirms in Ephesians 3:19-20 ...'And to know the love of Christ, which passeth knowledge, that ye might be filled with all the fulness of God. Now unto him that is able to do exceeding abundantly above all that we ask or think, according to the power that worketh in us.' This is an amazing truth and promise! Christ living His life in us! All the fulness of the Godhead [the Father] dwells in Christ. So with Christ living in us, we too can have God's fulness in us. This is the gospel message friends! This is the 'everlasting gospel' of the three angels messages (Rev.14). But great deceptions are in the world and even greater deceptions are coming, just as Revelation 13 reveals. And as Paul told us in 2 Thessalonians 2, those who have not a love for the truth, will be allowed to be deceived by the 'strong delusion' coming and will be forever lost! So we need to COME OUT OF BABYLON, come out of the confusion of the various churches, and UNITE with the Lord Jesus! Our safety is not uniting with the various churches. Our safety is not looking to the leaders for teaching and guidance, as we have only one true 'teacher' and Master, and that is our Lord Jesus Christ, the Son of the living God (Matthew 23:8). This is why Paul said for us to 'BEWARE' in Colossians 2. Because the world and the churches are full of 'philosophy' and 'tradition of man', which the majority of people have been deceived by. So remember the words of God. We are not saved by any church. We do not need to be a member of any denomination, or follow any person. And we do not need to look to 'another' for the Holy Spirit, as we are COMPLETE IN CHRIST! Wow! The Holy Spirit has just been 'poured out' at Pentecost and Peter is now speaking to the crowds that have gathered. And what does Peter tell them concerning the Spirit that had just been given? He confirms that it was Jesus Himself who received the Holy Spirit FROM THE FATHER and Jesus had now 'shed forth' this Spirit HIMSELF. Amazing! So does Jesus have everything we need? Yes! So John sees Christ (the lamb) HAVING the Holy Spirit (7 Spirits of God) as part of HIMSELF. There is no 'third being' involved. It's just God the Father and His Son Jesus who HAS His Father's Spirit to give to us. Which is why the Bible says that we are complete in Christ and that everything has been given into the hands of Christ. If Christ did not have the Holy Spirit Himself, and the Holy Spirit was 'another being', then we could not be complete in Christ and Christ could not have everything as the other Bible verses above say. It's amazing how many people stop at the words 'I will send you another comforter'. And miss the context of what Jesus was saying above. Clearly Christ was speaking of HIMSELF! This is truly amazing friend! It is Christ who 'dwells in our hearts' (Ephesians 3:17). It is Christ who lives in us (Galatians 2:20). It is Christ in us, that 'Spirit' which gives us life (Romans 8:10-11). Christ has everything we need! We need not look to 'another', as God the Father has given all things to His Son, including His own Spirit! This makes Christ COMPLETE, and it makes us complete in Christ (Colossians 2:10). Jesus even took on our fallen nature, so that He could be a COMPLETE SAVIOUR to us. See OUR PAGE HERE for the truth about this. And for even more information regarding the Holy Spirit being Christ Himself, please see our page WHO IS THE HOLY SPIRIT? WHO IS THE HOLY SPIRIT IS THE TRINITY BIBLICAL? We have a PDF version of this page (Complete in Christ) available for printing and sharing HERE.